A business standing in the way of Tottenham Hotspur's £400m stadium redevelopment plans has launched a High Court battle to stay put. The owners of Archway Sheet Metal Works on Paxton Road, Tottenham, are challenging a compulsory purchase order. The order could force Archway to make way for a new 56,000 capacity stadium. 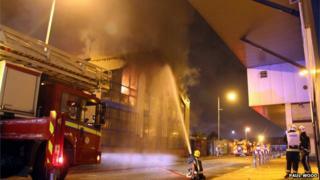 In November, fire gutted the premises, which are yards from the White Hart Lane ground in north London. The owners said they had received "bomb threats". Josif Josif, 46, who runs the family business, said at the time of the fire: "People were calling us and threatening us and we were receiving bomb threats and that started a few months ago, but we don't know if that's got anything to do with it." The firm describes itself as a "wonderfully old-fashioned family business" producing metal items for the catering and hospitality industry. The owners have been in a dispute with Spurs and Haringey Council - who issued the compulsory purchase order - for the last decade over redevelopment plans. A spokesman for Spurs said the club had successfully and amicably relocated more than 70 businesses in the area. "Whilst we were able to accommodate all these other businesses' requests, in the instance of Archway, we have been unable to reach agreement over the period of the last seven years," he said. The case brought by Archway Sheet Metal Works will be heard on 17-18 February by Mr Justice Dove, who revealed in court he is an Aston Villa fan. The club has planning permission for the new stadium it hopes to open for the 2018/19 season.